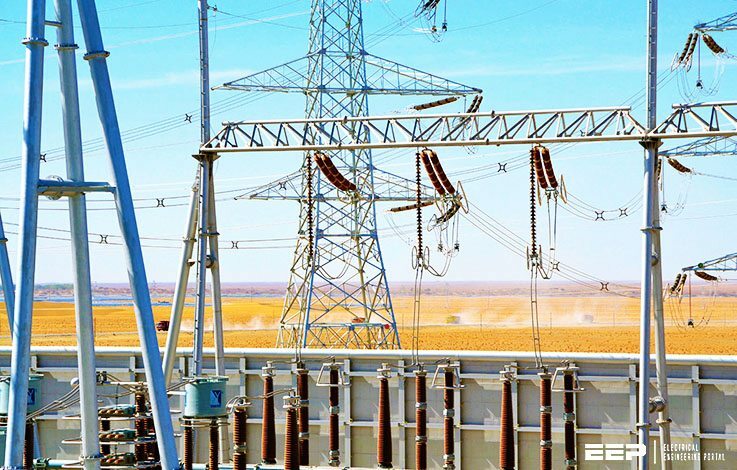 By transmission and distribution of electric power is meant its conveyance from the central station where it is generated to places, where it is demanded by the consumers like mills, factories, residential and commercial buildings, pumping stations etc. Electric power may be transmitted by two methods. Underground system is especially suited for densely populated areas though it is somewhat costlier than the first method. In over-head system, power is conveyed by bare conductors of copper or aluminium which are strung between wooden or steel poles erected at convenient distances along a route. The bare copper or aluminium wire is fixed to an insulator which is itself fixed onto a cross-arm on the pole. The number of cross-arms carried by a pole depends on the number of wires it has to carry. Line supports consist of (1) pole structures and (2) tower. Poles which are made of wood, reinforced concrete or steel are used up to 66 kV whereas steel towers are used for higher voltages. The underground system employs insulated cables which may be single, double or triple-core etc. The voltage at the consumer’s premises must be maintained within ± 4 or ± 6% of the declared voltage, the actual value depending on the type of load*. The loss of power in the system itself should be a small percentage (about 10%) of the power transmitted. The transmission cost should not be unduly excessive. The maximum current passing through the conductor should be limited to such a value as not to overheat the conductor or damage its insulation. The insulation resistance of the whole system should be very high so that there is no undue leakage or danger to human life. It may, however, be mentioned here that these days all production of power is as a.c. power and nearly all d.c. power is obtained from large a.c. power systems by using converting machinery like synchronous or rotary converters, solid-state converters and motor-generator sets etc. There are many sound reasons for producing power in the form of alternating current rather than direct current. Figure 1 shows a typical power system for obtaining d.c. power from a.c. power. Other details such as instruments, switches and circuit breakers etc. have been omitted. Two 13.8 kV alternators run in parallel and supply power to the station bus-bars. The voltage is stepped up by 3-phase transformers to 66 kV for transmission purposes** and is again stepped down to 13.8 kV at the sub-station for distribution purposes. Figure 1 shows only three methods commonly used for converting a.c. power to d.c. power at the substation.